Working out at a gym is usually good for your health, but not always. Perhaps you lifted more weight than you could handle. Or a piece of strength training equipment malfunctioned. Or the gym staff failed to instruct or spot you properly. Can you hold the gym owners or others liable for damages? There have been many cases in which plaintiffs have successfully sued gyms, sports clubs, Pilates studios and other exercise facilities for their injuries. Even if the gym owners were not aware of an unsafe condition, they may be liable if proper inspection would have uncovered it. Sometimes you may also be able to bring a product liability lawsuit against companies and individuals responsible for the design, manufacture, sale or distribution of a potentially dangerous exercise machine or its components. Equipment malfunctions are not the only basis for gym liability. You may be able to sue a gym for poor instruction or supervision. If an unqualified staff member imposed excessive demands, provided improper instruction or did not warn of potential risks, the gym itself could be liable for muscle injuries or other harm. One hurdle to overcome is the liability waiver that most gym members must sign when they join, promising not to sue if they are injured at the gym. Some courts have upheld these waivers, but there are also occasions when lawsuits are allowed to proceed despite a signed waiver. Gross negligence. Short of intentional harm, "gross negligence" is a form of reckless disregard for safety. For example, if gym employees were informed repeatedly that a piece of weight lifting equipment was not working properly and continued to allow people to use it without fixing it, that might constitute gross negligence. Vagueness. If the language in a liability waiver is so ambiguous that no one could reasonably be expected to make sense of it, a court may disregard it. Most well-established gyms use carefully vetted forms, however. 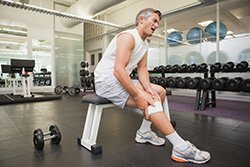 If you are injured, you should immediately report the incident to the gym and ask for a copy of any report prepared by the gym staff. You can show that document, along with any photographs you may have of any equipment involved, to a lawyer. Contacting an experienced personal injury attorney can help you decide if you have a case to pursue.